Ladies and Gentleman, It gives me great pleasure to introduce to you Debbie Bee. She is a local Oak Parker and lover of bees. Today is Debbie’s premier as our bee blogger. She’ll keep us updated and informed on the state of bees in our area, beekeeping tips, and the bees in her own backyard. With that, I give you Debbie Bee (applause)…. 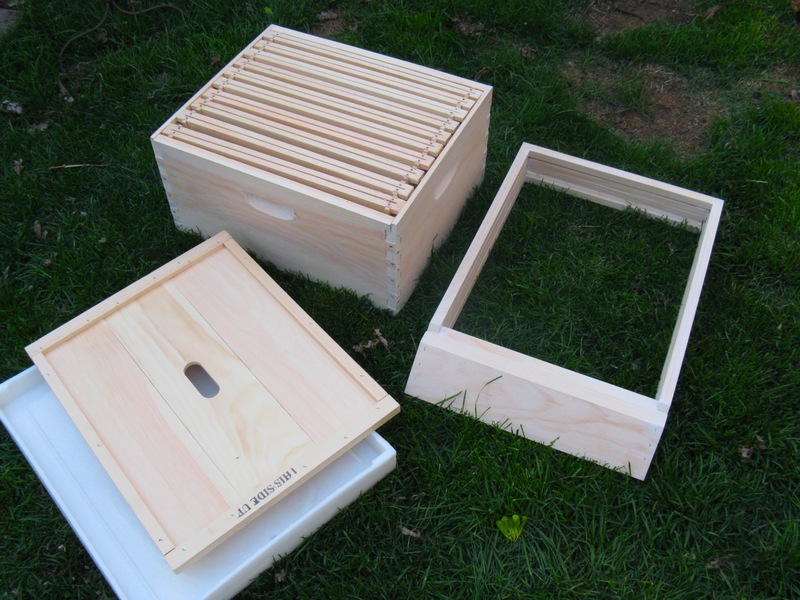 With beekeeping now legal in Oak Park, I’m looking forward to having hives in my back yard. Actually, that’s an understatement. I’m really excited, calm as I may appear. Because it’s important to remain calm when stinging insects are involved. Oak Park’s new ordinance has prospective beekeepers jumping through a lot of hoops: A permit is required, with a $75 fee and at least one inspection; no more than two hives per property; there must be a source of water, and maintenance records must be kept. That doesn’t sound too bad so far. But the ordinance also requires the beekeeper to own the property (renters need not apply); there must be a “flyway barrier”–a six-foot fence or dense shrubbery in front of the hive, with a 10-foot flyway between the hive and the barrier; the hives must be at least five feet from all property lines; and the rest of the beeyard has to be surrounded by a five-foot-tall barrier and have a latched gate with a sign stating, “Warning–Beehives on Property.” All that is a lot to pull together in a few months, not to mention costly. Added on to that is buying hives, bees, and equipment. It’s quite a commitment. With no guarantee of a good return. Kind of crazy. 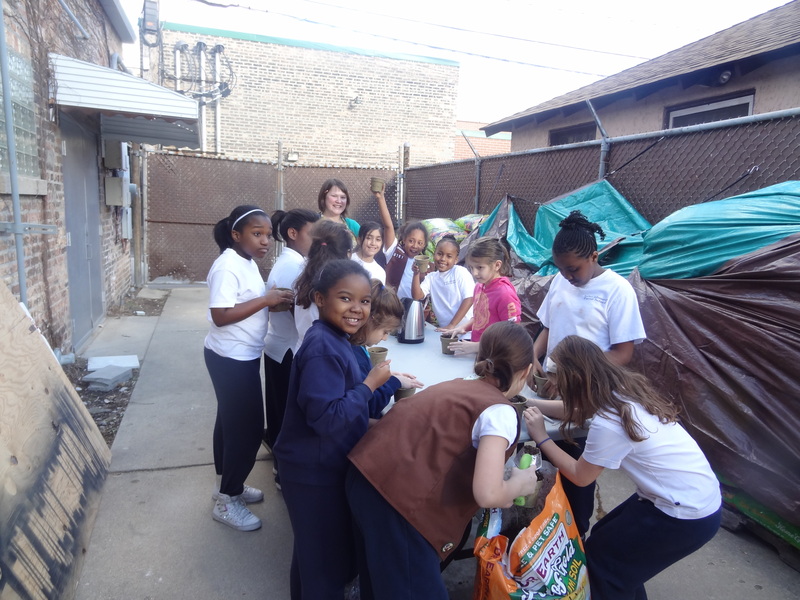 I got involved in beekeeping through the program run by the Garfield Park Conservatory Alliance. I had read that bees were struggling to survive, so I thought I’d look into becoming a beekeeper. I attended GPC’s first annual “Bee Forum” in 2008, took one of their beekeeping classes, and was added to the volunteer corps just about three years ago. One of the things that swept me into being involved was that the people I met at the Forum and class were among the nicest I’d ever encountered. There is an ‘esprit de corps’ among beekeepers–we have to trust each other when working beehives together. Volunteering is a great way to learn, and to be mentored. I was even allowed to manage one hive at Garfield Park, which was interesting, but it ultimately failed (the bees mysteriously starved to death right when the weather turned warm the other week). I’m not sure what happened, but I think the biggest problem was that the hive wasn’t accessible enough. Beginning beekeepers need to be able to keep an eye on things to get used to the rhythm of the colony, and see right away when something seems awry. So I look forward to having hives that I can monitor by looking out the back window, or going out to sit and observe the bees’ coming and going. Smelling the beeswax. Listening to the pleasant buzz of bees working. And, not least, getting some good, local honey out of the deal. To do this month: Finish building the hives and frames, and put foundation in the frames; paint the hives and bottom boards; create a level place to put the hives, ten feet from the six-foot fence; put up warning signs; wait to hear when the bees will be delivered (sometime in mid- to late-April)! Begonia and Buttercup were very popular! Jennifer wows the crowd with her chicken knowledge. 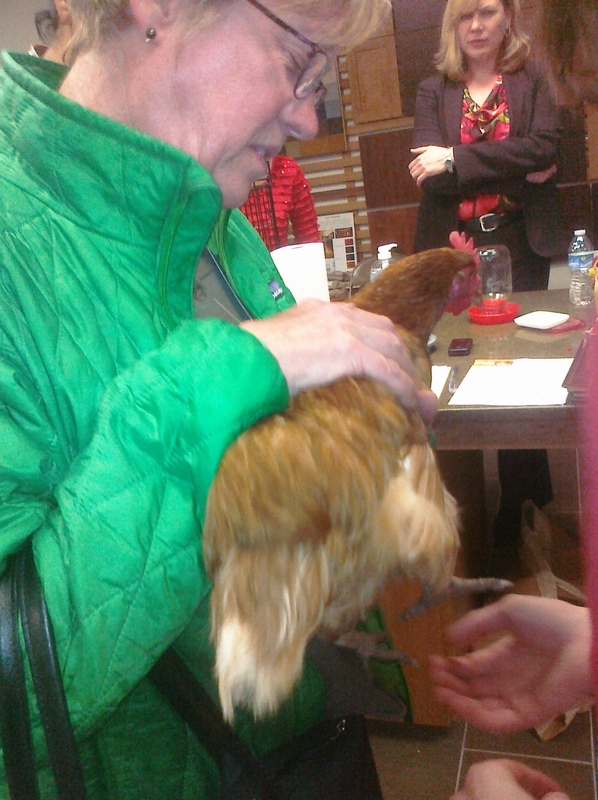 Tuesday night was a wonderful success for Green Home Experts and our future neighbor chickens. 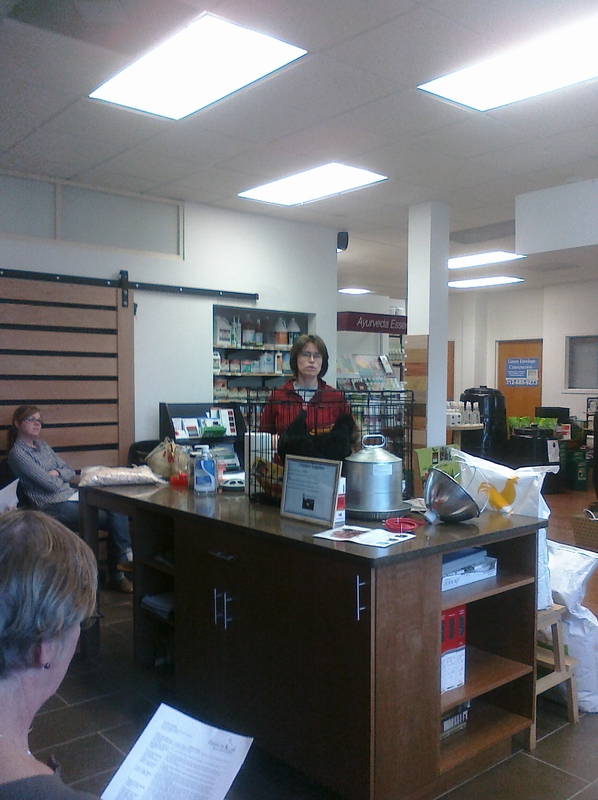 Jen Murtoff of Home to Roost demonstrated the basics on chicken keeping for a very enthusiastic crowd. Buttercup and Begonia, our guest chickens, were very willing and humble volunteers. 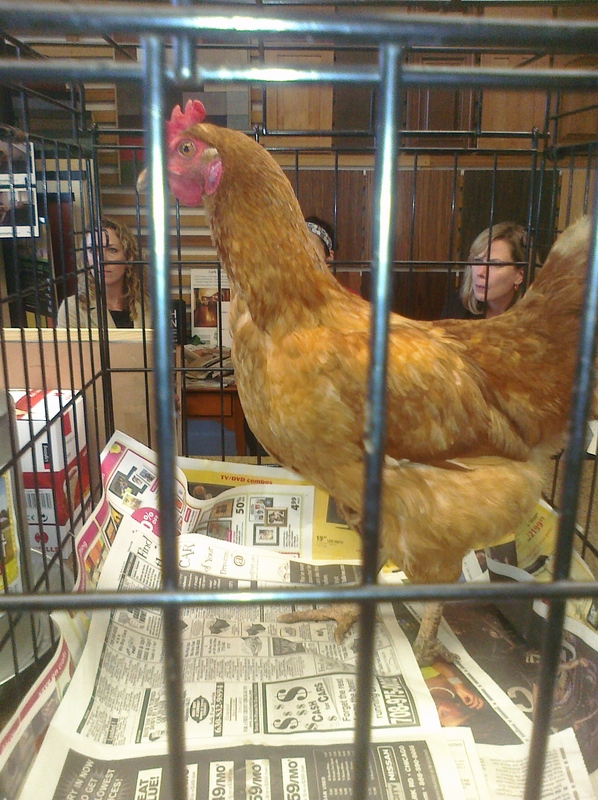 Folks from Chicago, Evanston, Brookfield, Forest Park and Oak Park to learn about keeping chickens in their yard. Jennifer reviewed the variety of chicken breeds, caring for chicks, and keeping your chickens healthy. 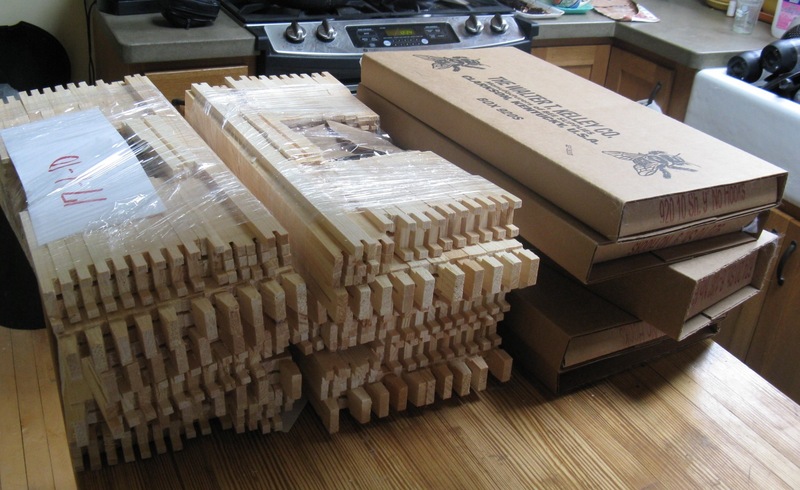 If you’re interested in taking the plunge into chicken keeping, come check out our supplies! If you already have chickens, check out our organic soy-free feed! Green Home Experts is currently accepting submissions from local 501(c)3 non-profit organizations for our Share the Green program. Share the Green is a shop and share format that donates 10% of sales to participating organizations. Each group is assigned one weekend out of the year, May through November. Supporters who shop at Green Home Experts with their Share the Green vouchers are doing two good deeds in one–bringing home eco-friendly items that are healthy for their family as well as supporting their favorite cause. 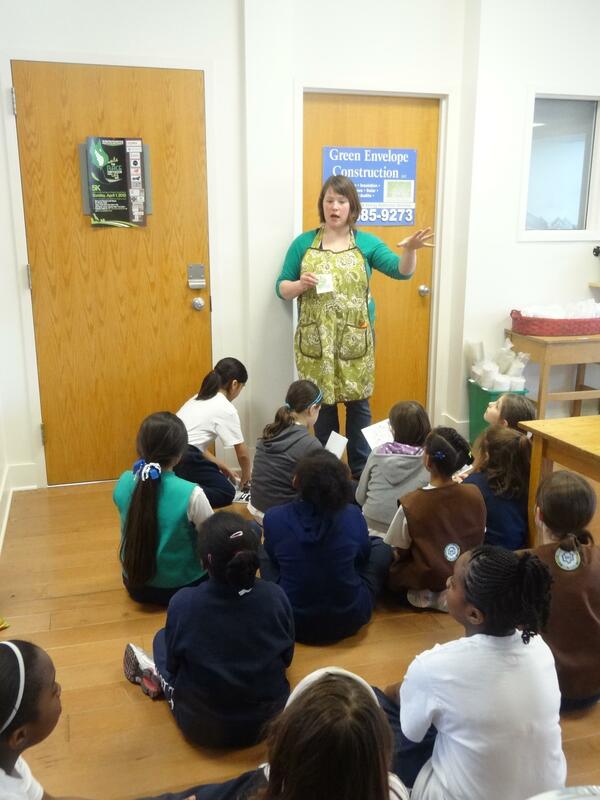 A few days ago, 23 wonderful Girl Scouts from St. Edmund’s visited GHE. The came on March 8, International Women’s Day. We started the session by talking about why it’s great to be a woman. That was an easy one! They were a very engaged group who asked wonderful questions and were a joy to be with. Since they’ve been working on a composting badge, my worm bin was familiar to them. After one brave volunteer offered to smell the worm castings (“It smells like dirt!”), we had 22 more volunteers after that. We planted lettuce seeds in BioPots and topped them off with some worm castings. Since it was a warm, sunny day, we did it outside in our garden center. 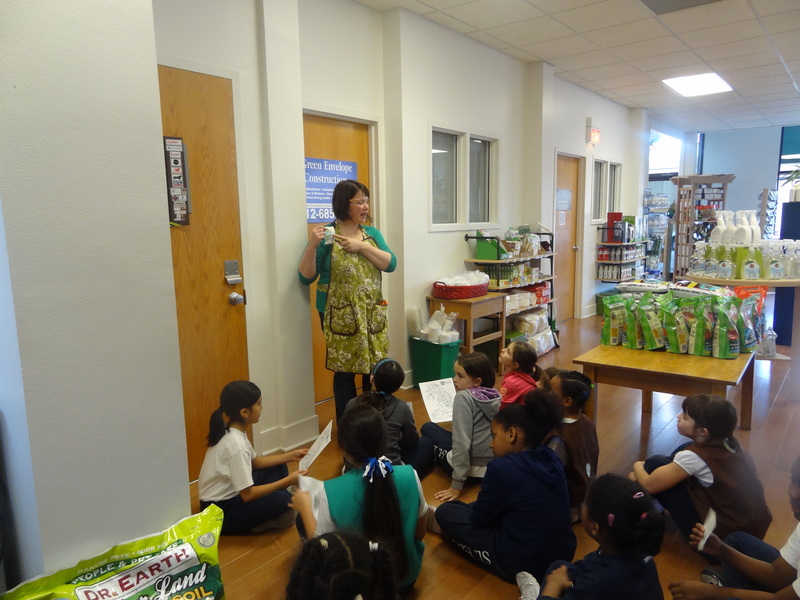 We also talked about non-toxic fertilizers, cleaners and paints. We spent a good 20 minutes talking about making informed decisions. We compared the ingredients and warning labels on conventional cleaners versus our line of products. One girl even told us about greenwashing! (Which is not green cleaning; it’s the deceptive use of green PR or marketing). Oh, what I’d do to be able to engage most adults like this! There’s no doubt in my mind that one day, those ladies will be mentoring the next generation of Girl Scouts about their businesses. Thank you, Girl Scouts, for giving me a wonderful reason to celebrate International Women’s Day. A fellow business owner recently encouraged me to celebrate the little things in our daily routine, and her timing was perfect. 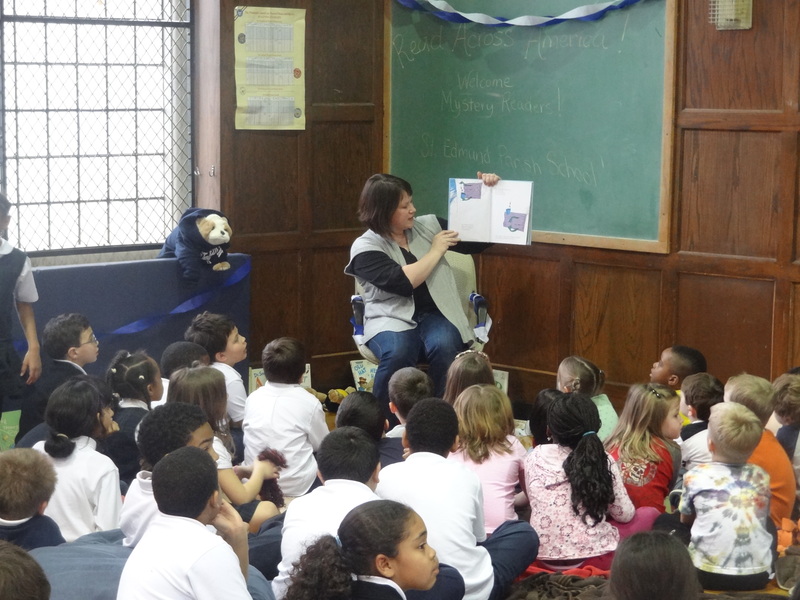 Last Friday, I was invited to be the Mystery Reader for the wonderful kids at St. Edmund’s in Oak Park. They were celebrating Read Across America Day, which was the same day as the opening of the movie The Lorax, a new take on Dr. Suess’ classic book. I was invited to read The Lorax, and my son came along. He was enchanted by all the big kids, and I think he was more popular than I was. In case you haven’t read the book (which I highly recommend), it has an environmental theme. It’s about an industry that decimated its natural surroundings as it grew bigger (and biggerer). The book encourages children to stand up for the planet and be conscientous of Mother Earth. I was honored to be the Mystery Reader for these wonderful children. When I landed on the part of the book where the thneed business has to get bigger and biggerer, and the area got dirty and dirtier, I swelled with pride. My business is getting bigger and biggerer, which means our tiny corner of the planet is actually getting cleaner and cleanerer! 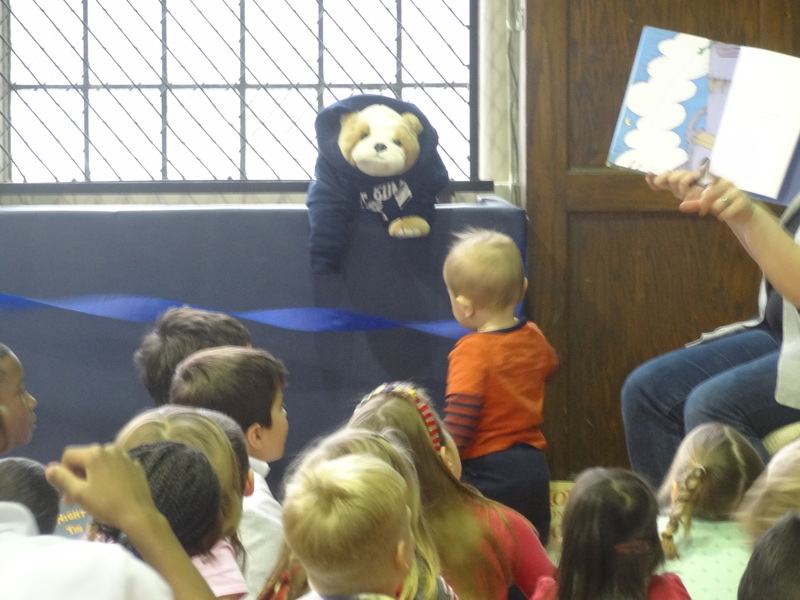 As I turned to go on to the next page, I locked eyes with my son–he was frozen, watching me teach these students about doing what’s right for the Earth. It was a very proud moment for me, and the words on the page got a little blurry as my eyes teared up. When the book was finished, the students presented me with a gift that hangs proudly in my office, near my son’s toys and playpen. This day was definitely a little thing I’m still celebrating. 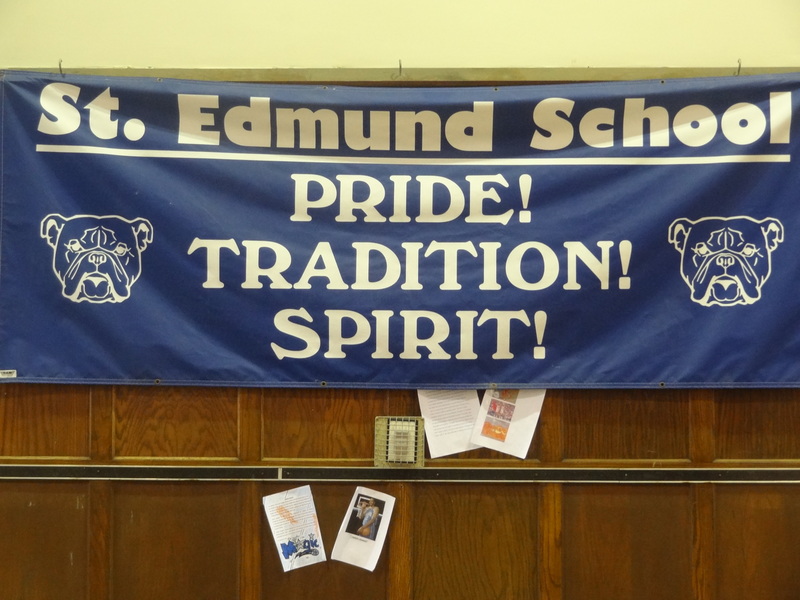 Thank you St. Edmund’s!